The sun and the moon pull on the Earth, just as dual energies pull on our consciousness. To understand Hatha Yoga, the Yoga of the Sun and the Moon, watch Colin Legg’s Ring of Fire. 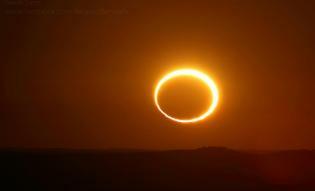 From western Australia, this time-lapsed, photo montage was taken of the May 10th, 2013 solar eclipse. The sun and moon’s dance across the horizon illustrated the breath-taking beauty of what happens when we balance opposing energies. It was a cosmic reminder that grace and alignment is possible.